As we all know from Ms Gjeometry a good warmup is essential before an event. So, before the BIG DRAWING!!!! for The Plus Sized Pattern Pyramid, my stars needed a little exercise. So, in a failed attempt to make it all about me, I reveal one of my favorite unblogged pieces from this summer. New Look 6802. Mine is of course tunic length, my favorite thing! Now this pattern is one of those ‘pass over you 4 million times, now I’ve made you where have you been all my life?’ patterns. I enjoyed the make, loved the little knotty twisty business, didn’t even get any knit wedged under the throat plate. Yippee! My only changes involved the side panels. As the pattern is designed, they come down far on the hips and perhaps on another, create a svelte line. On me they felt confining. I likes a bit of swish to the skirt, so I gathered it up to just under the bust. I got the look without the confinement. But what exercise were you speaking of Anne? Here I must tell a tale. But you won’t repeat it, will you? Last week Bruderlein was cruelly looked upon by his physician and declared portly. Um, ok, I knew this was coming but what can I say? He is his mothers pup- his hobbies all involve reclining, watching, commenting and light snacking. So now we have a nightly jaunt planned. With sisters of course for encouragement. From their standpopint, it went well. One more shot of the tunic then onto the drawing- I’ve made you wait long enough, right? Now. My little assistants have all been sequestered while we set up the intricate drawing area. All names have been put on a beloved toy ‘rave wristband’ style. The first toy to be claimed and carried off will be our winner. 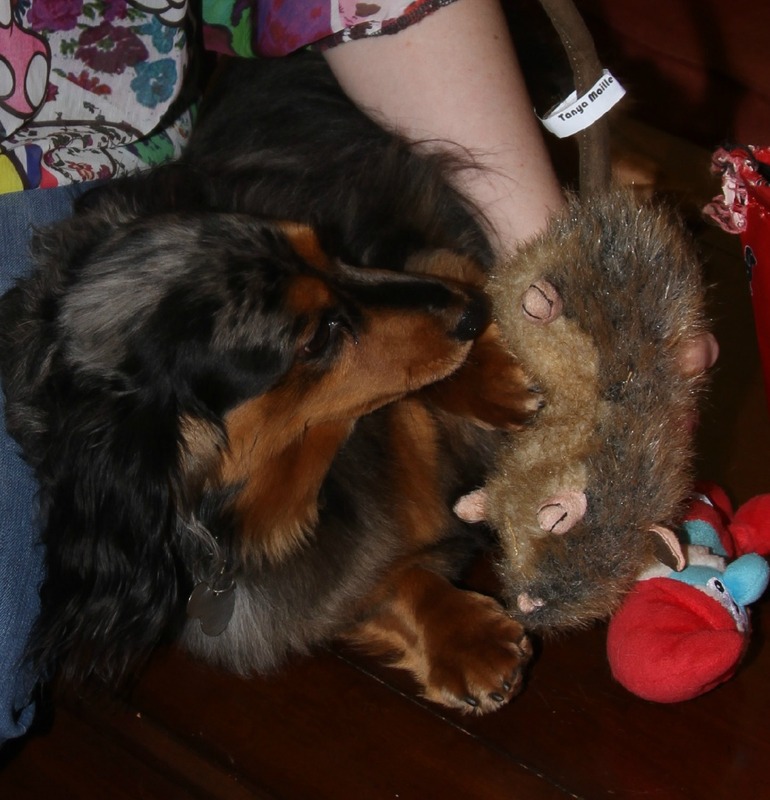 Will it be Mr Jingles, Liesl’s stuffed rat? One of Katze’s prized smurfs? Perhaps Bruderlein’s meerkat? 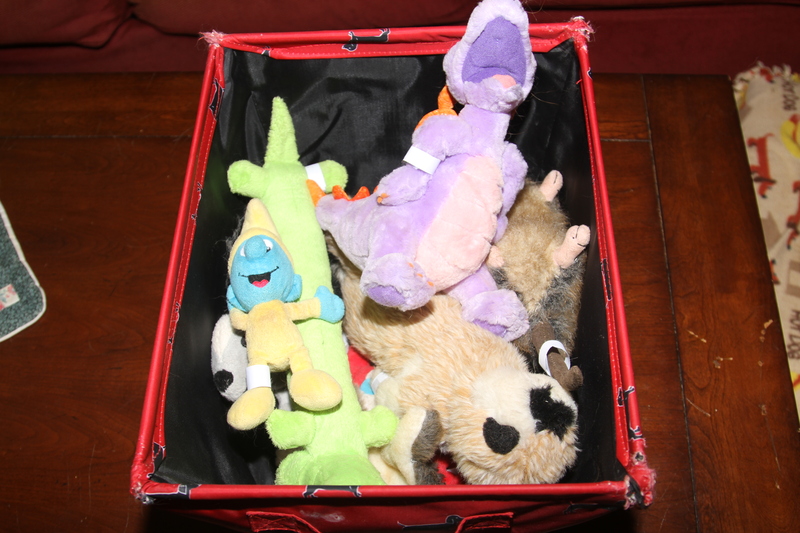 Many other popular and well-chewed contestants are in the box and we are all ready! They ignore. This could take a while, but its a marathon, not a sprint here at Chez Barnes! I should have put a bands on one of the cats. Hmmm. Ok, Flannery vetoes that. Oh, they are on it now! Here we go, it’s looking like a real pressure cooker situation here- Down in front! We can’t see the action! I knew I should have invested in a ‘toybox cam’ for this! They’ve moved the box onto the floor, looks like they are getting serious now! Ok, I think we have a winner! It’s Liesl with Mr Jingles for the win!!!! The crowd goes wild! I really thought she was leaning toward the gator, but no, the squeaker was faulty! Now, who had their name on the winning toy? I know, I know, this is all very exciting. Perhaps we should pause here for a public service announcement about spaying and neutering……..NO!!! We are going to announce our winner. It’s Tanya Maile – our Mrs Hughes!!!! Tanya, please email me at bmoviemouse(at) hotmail(dot)com with your address and thank you for playing!!!! Now let’s get these players to the showers!!! photo credits: Pattern Review, meadhawg,On the Road tho Sew where, google images. All images remain the property of their original owners. Its been a serious summer staple! I need 3 more! 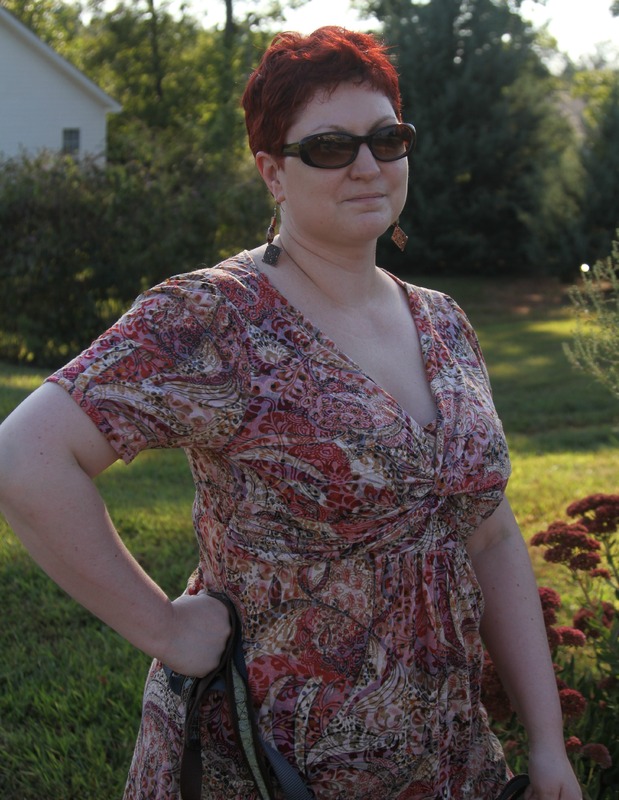 Love this dress shortened into a tunic, too – and the gathers adjusted. Looks great 🙂 You’re right – this pattern is easy to pass by. I almost didnt review it, its been so covered but i wondered if anyone else had gathering issues…. This is very pretty – some of my fave colours! Me too! I just did my palette and it is all these shades…. These might get laundered now and again- they get so gamey!! Cute, flattering and pretty. What more could a girl want?! That is one fab tunic. Really suits you. I have the same sad experience when I take my cats to the doc. They take one look at Tiff (who weighs almost 9kgs – for a cat that is big) and they immediately ask “what do you feed her!!!??”. I think I need to put the cat on a leash and take her for a walk. Your dogs look like they have you under control! Love the draw for the PPP. Glad you reviewed the dress. I will look at this pattern now. Love the print you chose for your tunic top! It’s a very flattering style and looks so comfy! They always have their own ideas! This pattern is really flattering on you. It’s the first time I’ve seen it reviewed but then I do not lurk on PR that much nowadays. Your fans decree you must make more! I just cant believe how long Ive ignored this pattern! It was quick too! beautiful top! and your dogs are so cute it hurts. They are so rotten, but sweet! Pretty, pretty outfit – I love makes that are stylish and comfy. Great work by your lovely assistants and congrats to Tanya! As usual I try to match my companions! Oh my! I was just enjoying looking at a hot lady in a hot tunic with three cuties and I keep reading to find that I won!!!! Wow!!! 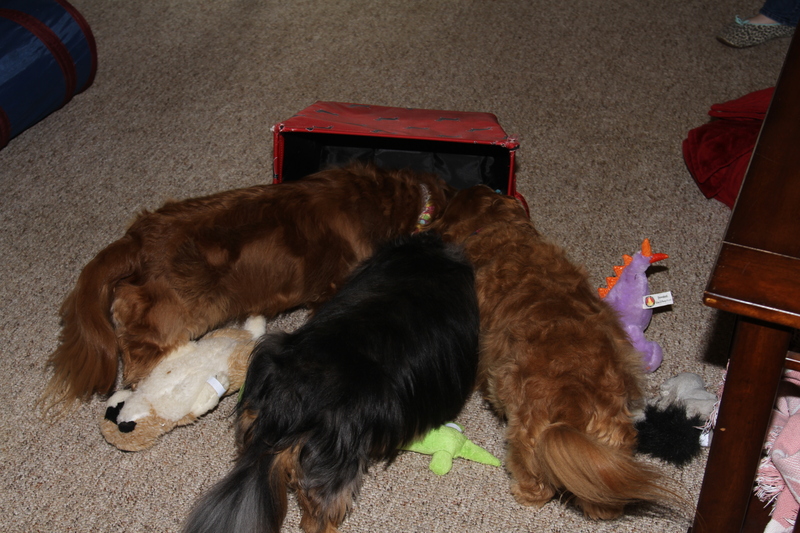 The doggies know a dog lady when they sniff one! And what a clever way to choose. 🙂 Thank you!!! Congrats- cant wait to see what you use! OMG. You take the cake for the Most High-Larius drawing ever. So funny. And your tunic is wonderful. It makes the girls look great! Gjeometry has set the bar quite high for drawings- I will have my work cut out for me next time! I must be the only person who hasn’t seen this pattern before, which is a pity because it looks so great on you that now I want it really badly! Great spring/autumn top. I hate to say it but I forget about Newlook until someone brings it to my attention! 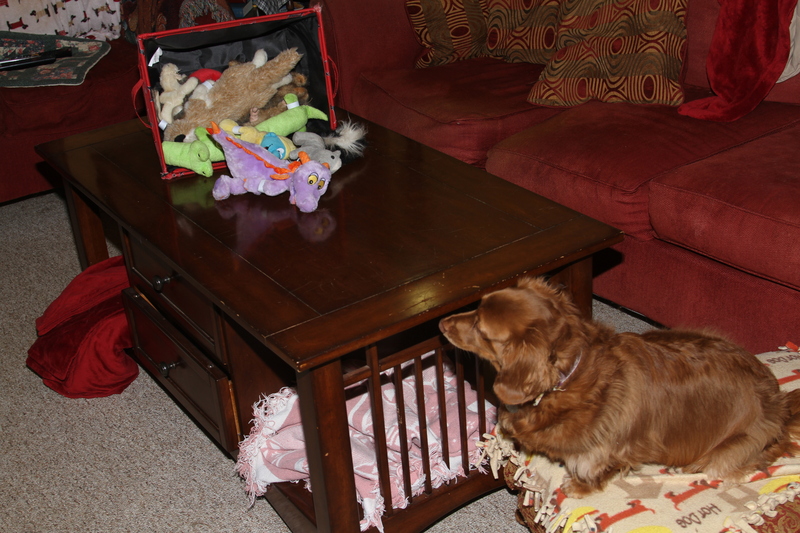 Okay, I am just in awe that you have 3 dogs and many stuffed toys..intact. Those are not just toy “skins”!!! What is the secret???? And don’t you look GREAT walking that flashy trio of well behaved toy caretakers. I’m impressed with the top. It looks beautiful and comfortable. A winning combo. 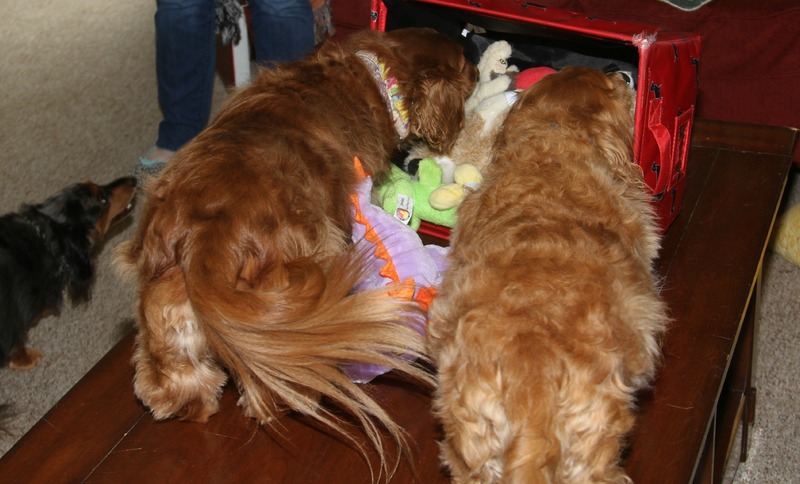 They seem to think that most toys are for stuffing under the sofa or perching on! This is awesome! It really looks good on you especially in this print! I’ve never seen this pattern before, but I will definitely be keeping an eye out of it now…! New look slips under my radar all the time! Ive been afraid of those knots, but it was so easy! Yes, me too! Easy though?? Will have to give it a go as it looks so good! Lovely top, I may have to look at this pattern, loving the neckline and knotty detail. Nice choice of fabric too, great job. My knit fear is almost contained now! Did your dog just win a rat?! 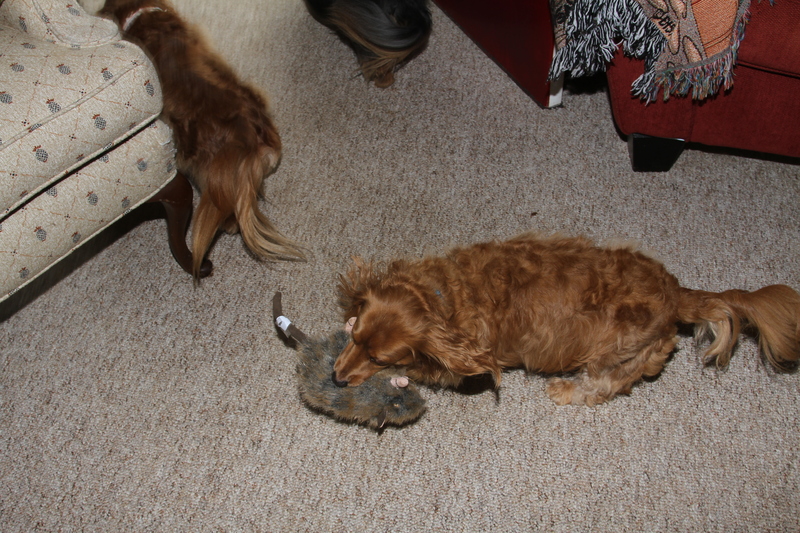 Yes, my dainty girls favorite toy is a rat the size of her head. So sweet…..
Great tunic – I can see why you would want more. What’s not to like with a great tunic? This is as close to athletic wear as I can handle!! A knit (http://www.flickr.com/photos/ajhewing/9781945016/) that will hopefully be sewn up in V1027… I’m terrible at secrets! 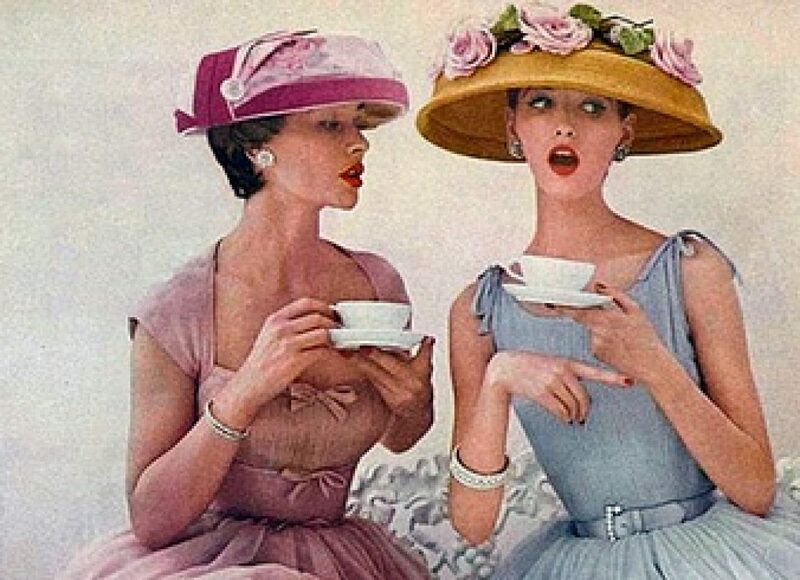 Oh thats going to be fabulous! Such fun! Congratulations to Mrs Hughes. And your tunic is fantastic! that will definitely hide my cake baby! another pattern added to my list. Mrs Hughes has much on her plate with the fabricmart contest- maybe these will help! 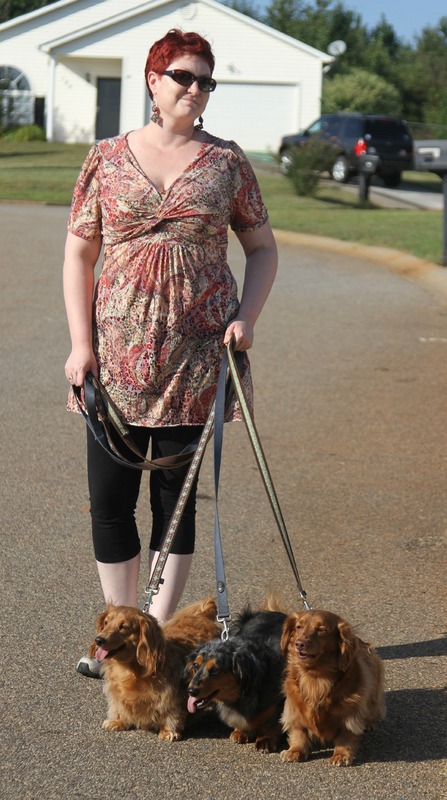 That tunic top is so flattering on you…both colour and style, but I think your gorgeous doggies stole your limelight a little bit. They always do!!! I think secretly I am my husbands 3rd favorite redhead! Beautiful tunic – looks great on you! I can see how you overlooked it though, the pattern drawing on the front is not so inspiring! It feels a little dated- especially the ling sleeves! Toy box camera, YES! I also think you might have missed a career announcing play by plays. 🙂 Love the tunic top, looks like just the thing to take Bruderlein on his nightly jaunt. Arf, Arf! Im so ready for my gig at the puppy bowl!!! Really cute top. I love the fabric. Fabric mart- just love em! That was brilliant! What obliging dogs your have added to looking really good in your tunic too – perfect! Ah, forget the pyramid…I love your tunic and I love the fabric!! I just sewed a tunic out of this as well! Does that make us sisters? I think perhaps we the Australian people should have borrowed your dogs last weekend to choose our new Prime Minister – we might have ended up with a better choice ! Anyway your little dogs and you look totally cute – loving your new tunic. 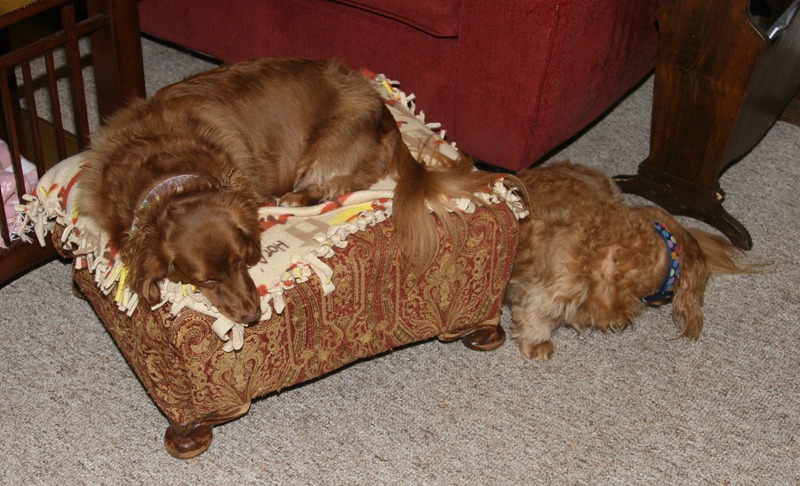 Dachshunds have very strong opinions- it could have gotten interesting!! Now that’s a cool tunic. It gives you gorgeous shape and the fabric is a great colour. The suspense was killing me too! It was rough in the judging area!! No flying fur I hope. See, twisty bits are easy really. Love the top, but that has to be the best prize draw ever. I am still grinning like a loon after those photos. They are very full of themselves, these pups! I will keep you posted on Bruderleins weight loss! Love the top! The colors, print, and style are all very flattering! I keep looking at those twisty patterns. I’m going to have to try one. Or five. Cute doggies too! It was really a fun make! This is a great tunic! Love the fabric- looks so good on you. 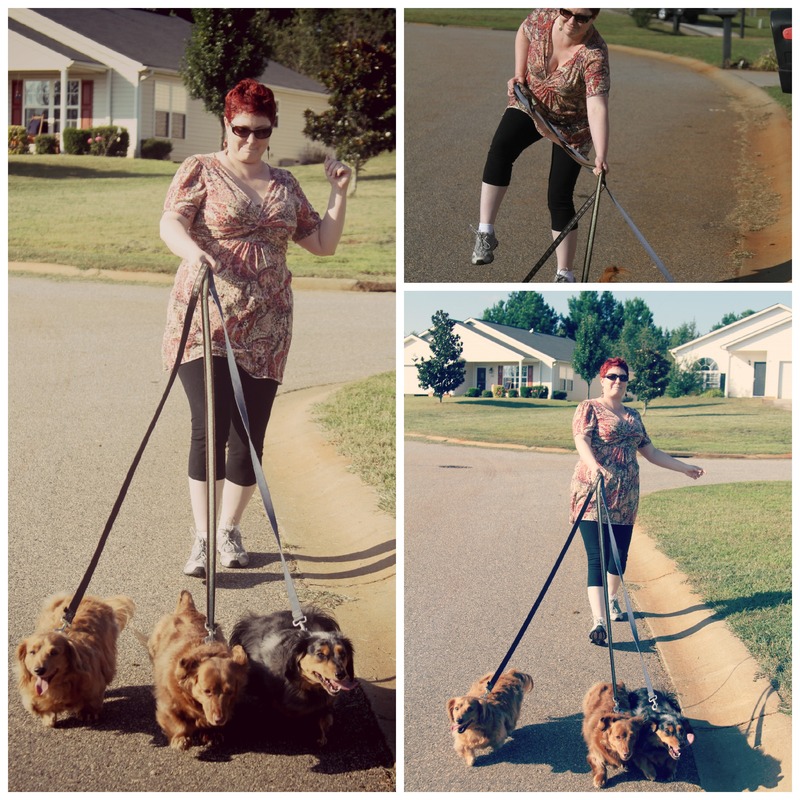 That tunic looks stellar on you, and it’s obviously well designed to cope with three terrifyingly independent pups. Your draw is of course hilarious. Congratulations to the winner!